Author contributions: Soto M, Sampietro-Colom L, Lasalvia L, Mira A, Jiménez W and Navasa M conceived and designed the study; Soto M, Sampietro-Colom L and Navasa M analyzed the data; Soto M, Sampietro-Colom L, Lasalvia L and Navasa M wrote the paper. Supported by Siemens. Marcelo Soto received financial support from Plataforma ITEMAS PT13/0006/0009 (FCRB PI043029, partially). Conflict-of-interest statement: Lasalvia L owns shares of Siemens and is a Siemens employee. Navasa M reports grants from Siemens, during the conduct of the study. Jiménez W reports grants from Siemens, prior the conduct of the study. Siemens has issued patents on ELF. A Markov model was developed to simulate LF progression in HCV and ALD for a cohort of 40-year-old men with abnormal levels of transaminases. Three different testing alternatives were studied: a single liver biopsy; annual Enhanced liver fibrosis (ELF™) followed by liver stiffness measurement (LSM) imaging as a confirmation test if the ELF test is positive; and annual ELF test without LSM. The analysis was performed from the perspective of a university hospital in Spain. Clinical data were obtained from published literature. Costs were sourced from administrative databases of the hospital. Deterministic and probabilistic sensitivity analyses were performed. In HCV patients, annual sequential ELF test/LSM and annual ELF test alone prevented respectively 12.9 and 13.3 liver fibrosis-related deaths per 100 persons tested, compared to biopsy. The incremental cost-effectiveness ratios (ICERs) were respectively €13400 and €11500 per quality-adjusted life year (QALY). In ALD, fibrosis-related deaths decreased by 11.7 and 22.1 per 100 persons tested respectively with sequential ELF test/LSM and annual ELF test alone. ICERs were €280 and €190 per QALY, respectively. The use of the ELF test with or without a confirmation LSM are cost-effective options compared to a single liver biopsy for testing liver fibrosis in HCV and ALD patients in Spain. Core tip: Noninvasive methods to diagnose liver fibrosis have been proposed as an alternative to liver biopsy in patients with abnormal level of transaminases. In a Markov model, sequential testing with enhanced liver fibrosis (ELF) test followed by liver stiffness measurement (LSM) significantly reduce liver-related lifetime morbidity and mortality, compared with biopsy, in hepatitis C virus (HCV) and alcoholic liver disease patients. Noninvasive methods are also associated with an increase in quality-adjusted life years and costs. Overall, they are cost-effective strategies compared with biopsy. ELF test with or without a confirmation LSM may represent a more affordable strategy than the “treat-all” option in HCV patients. The tremendous advances made in biomedicine and biotechnology during the last decade have led to long-standing “gold standard” invasive diagnostic and therapeutic procedures being challenged by novel, rapid, and noninvasive methods. Noninvasive diagnosis of liver fibrosis (LF) is one of the fields that has evolved most rapidly in recent years. Diagnosis and follow-up of liver diseases has long relied on liver biopsy, and only recently has its value as a method to assess the severity of LF or to follow-up disease progression been questioned. Though biopsy is used to stage most cases of liver disease, it is well known that this procedure has several limitations. First, liver biopsies sample only an extremely small portion of the liver (1/50000) and, therefore, sampling errors can occur, especially when smaller sized biopsies are analyzed. In addition, histological examination is prone to intra- and interobserver variation, which may occur even when widely validated systems are used to score liver damage. Finally, liver biopsy is an invasive procedure with associated morbidity: pain occurs in 20% of patients and major complications (such as bleeding or hemobilia) in 0.5%. For this reason, liver biopsy has poor tolerance, particularly if it needs to be repeated over time in an individual patient. Moreover, patients are nowadays aware of noninvasive methods to assess the degree of liver damage and so they may be reluctant to undergo an invasive procedure. Most well-validated noninvasive methods have shown good diagnostic accuracy in identifying patients with a significant degree of fibrosis (i.e., fibrosis expanding beyond the portal tract). Sensitivity and specificity above 85% can be considered sufficient due to the lack of relevant clinical consequences for false-positive and false-negative cases. In addition, noninvasive tests can be repeated over time, and in cases of indeterminate results two or more methods can be combined. Although the identification of significant fibrosis (≥ F2) has been regarded as an important target [particularly in the field of viral hepatitis, hepatitis C virus (HCV)], its real value as a static measure of disease severity is arguable. The identification of individuals with bridging fibrosis or liver cirrhosis is more critical: in such cases, sensitivity must be very high, not only due to the potential indication of a specific treatment, but also because screening for hepatocellular carcinoma and gastroesophageal varices is mandatory in patients with liver cirrhosis. Fortunately, the performance of noninvasive methods to assess the presence of cirrhosis is excellent[4,5]. A different approach is the sequential evaluation of the severity of liver disease when screening candidates for a specific treatment or intervention or a different follow-up, i.e., prioritization in the treatment of HCV, interventions in alcohol consumption or diet, and follow-up of patients with cirrhosis. The sequential use of an enhanced liver fibrosis (ELF) test (as a blood test for patients with suspected liver disease), and LSM (as a specific tool to confirm the presence and severity of liver disease) has been proposed and, theoretically, it could be easy to apply. However, health and economic implications of this approach have not been reported. Therefore, the aim of the current study is to assess both the accuracy of the sequential use of ELF test/LSM in the evaluation of the severity of liver disease and its cost-effectiveness compared with the use of biopsy in patients with HCV or alcoholic liver disease (ALD). A Markov model was developed to estimate clinical outcomes and associated costs of the different options for assessing liver fibrosis. Three mutually exclusive testing strategies were considered in the analysis (Table 1): (1) a unique percutaneous liver biopsy; (2) annual ELF test with confirmation LSM in case of a positive ELF score; and (3) annual ELF test alone. Outcomes were also computed assuming that no test for liver fibrosis was performed. ELF: Enhanced liver fibrosis test; LSM: Liver stiffness measurement; HCC: Hepatocellular carcinoma; DC: Decompensated cirrhosis. In the base case analysis patients were 40-year-old men with abnormal levels of transaminases and diagnosed with HCV or ALD. The analysis was conducted separately for each etiology group. In the Markov model, disease progression is represented as transitions between different health states over time, which was modeled here as a series of 3-mo cycles (Figure 1A and B). Individuals face probabilities of moving to a different state according to their initial and ensuing health condition, treatment, and age. Each health state is associated with specific utility levels and costs (e.g., hospitalization, screening, or follow-up). Clinical outcomes considered in the analysis were the rate of correct diagnosis of each test (true positives and true negatives), frequency of adverse health events, and quality-adjusted life years (QALYs). Direct healthcare costs of each testing strategy were estimated from the perspective of a health care provider (Hospital Clínic Barcelona). Differences in QALYs and costs between testing strategies were used to compute incremental cost-effectiveness ratios (ICERs). QALYs and costs were evaluated from the beginning of the liver assessment with a lifetime horizon and were discounted at an annual rate of 3% in accordance with common practice in the literature and Catalan Health Service (CatSalut) guidelines[9-11]. The analysis was performed using STATA 13.1 (StataCorp, College Station, Texas, United States). 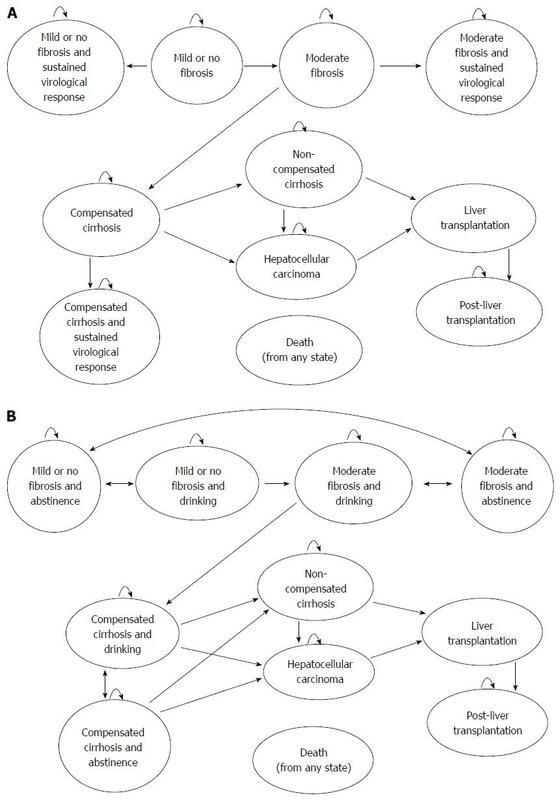 Figure 1 Markov models for hepatitis C virus (A) and alcoholic liver disease (B). The structure of the Markov model used in the analysis is similar to earlier work done for surveillance and treatment of HCV (Figure 1A)[12-15]. The model is a simplified representation of the natural history of HCV. Fibrosis severity is characterized by three different health states according to the METAVIR scoring system: no fibrosis or mild fibrosis (F0-F1); moderate or severe fibrosis (F2-F3); and compensated cirrhosis (F4). An individual with compensated cirrhosis may develop complications and move to a decompensated cirrhosis (DC) state. Both compensated and decompensated cirrhosis may lead to hepatocellular carcinoma (HCC). Individuals with DC or HCC are candidates for liver transplantation (LTX), which takes them to a post-LTX state or death. The additional following assumptions were made in the present model: (1) fibrosis caused by HCV is not reversible but once SVR has been achieved, progression of fibrosis is permanently stopped; (2) responders to antiviral treatment achieve SVR in the quarter following the end of the treatment; (3) the efficacy of antiviral treatment is the mean efficacy in untreated genotype 1 as reported by Afdhal et al (ION-1 Study); and (4) there is no excess mortality associated with LF (including compensated cirrhosis), as the main cause of death of these individuals is accounted for in the model by the other health states (HCC, DC, LTX, and post-LTX states). In the model HCV individuals that test positive for LF ≥ 2 receive a combination of sofosbuvir and ledipasvir over a 12-wk period. Recent research has shown that the combination of these drugs achieves high levels of sustained virological response (SVR) in both treatment-naïve and treatment-experienced HCV genotype 1 patients[17-19]. Additional evidence shows that the combination of these two drugs is cost-effective compared with standard of care for most eligible patients in the United States. We assumed that only individuals that test positive for LF are treated with antivirals. Patients in a DC, HCC, LTX, and post-LTX state received the standard of care. The model used for ALD (Figure 1B) is based on earlier work on fibrosis progression in heavy drinkers[21-24]. ALD individuals are annually tested for LF and those obtaining an F ≥ 2 result receive detoxification therapy. In the quarter following the beginning of therapy, some ALD individuals achieve abstinence. Other assumptions specific to the ALD model are: (1) all patients receiving a positive diagnosis of LF agree to undergo detoxification therapy; (2) individuals in an abstinence state may relapse and return to a “drinker” state; (3) fibrosis in its medium/severe (F2-F3) degree is reversible if individuals are in an abstinence state; and (4) drinkers in a LF state face an elevated mortality risk, as they are confronted with causes of death different from those directly linked to liver disease (e.g., accidents). Detoxification for ALD individuals with positive LF results consists of psychological and psychiatric therapy provided by Hospital Clínic staff for 1 year. The model assumed that the length of treatment did not depend on the drinking behavior of individuals; that is, both abstainers and individuals with early relapse received a full year therapy. Model parameters are listed in Table 2. Estimates for clinical values (i.e., transition probabilities, test accuracy, effectiveness of antivirals, alcohol abstinence and relapse rates, and utilities) were obtained from a literature search in Medline[12,15,17,22-36]. Priority was given to estimates for Spanish population or to studies based on a large number of patients. Whenever it was possible, sensitivity and specificity estimates were specific to each etiology group. In ALD patients, for whom no specific information on ELF testing was available, it was assumed that the ELF test had the same accuracy as in HCV individuals. All specificity and sensitivity parameters were changed in the sensitivity analysis to explore how these assumptions affected baseline results. In the base case analysis, liver biopsy was assumed to have a 90% sensitivity and specificity for both groups of individuals. Research has shown that biopsy may underdiagnose cirrhosis in up to 14.5% of HVC individuals, and such lower accuracy levels were considered in the sensitivity analysis as well. Table 2 Transition probabilities, accuracy of tests, and other parameters. 1PSA: Probabilistic sensitivity analysis; In beta (β) and gamma (γ) distributions, parameters correspond to mean and SD; In uniform (U) distributions, parameters correspond to minimum and maximum values. F0-F1: No fibrosis or mild fibrosis; F2-F3: Moderate or severe fibrosis; F4: Cirrhosis. ELF: Enhanced liver fibrosis test; LSM: Liver stiffness measurement; LF: Liver fibrosis; DC: Decompensated cirrhosis; HCC: Hepatocellular carcinoma; LTX: Liver transplantation. In the absence of utility estimates for the Spanish population, we used standardized measures of health status for HCV individuals as reported by Wright et al (Supplementary Table S1). These values are in accordance with data commonly used in the literature. Cost data were obtained from Hospital Clínic sources, published literature, and the Spanish Ministry of Health & Social Services and public sources[38,39] (Supplementary Table S2). Historical costs were adjusted to 2013 prices according to the Spanish price index for hospital services. Percutaneous biopsy has a mortality risk of about 9 of every 10000 persons tested, which was accounted for in the model. Biopsy is also subject to discomfort and nonfatal adverse events. Although there are no direct measures of the effects of biopsy on utility, recent research assumed that nonfatal adverse events are associated with an annual utility decline of 0.2[15,28]. Because this assumption disfavors biopsy, sensitivity analyses were performed to assess the consequences on the results if a smaller reduction in utility is assumed. Wright et al report a mean utility decrement of 0.11 during treatment with HCV antivirals and a utility rise of 0.05 in individuals for whom treatment is successful. Following the findings of the authors, we assumed a 0.11 utility drop during one quarter for individuals that are treated and a permanent increase of 0.05 for individuals that achieve an SVR state. Utilities for ALD individuals were assumed identical to those used in HCV. Sensitivity analyses were undertaken to explore the robustness of results with changes in these assumptions. No reliable epidemiological data for prevalence of LF and cirrhosis in HCV and ALD for the Spanish population were available. Following clinical opinion and earlier work for the United Kingdom, we assumed a base case prevalence of F ≥ 2 of 53% among the HCV and ALD population. The corresponding prevalence for compensated cirrhosis was 20%. Prevalence rates were varied in the sensitivity analyses to explore the robustness of base case results. One-way deterministic sensitivity analysis was performed to explore the parameters that had the highest impact on QALYs and costs. Low- and high-value parameters used for the analysis are described in Table 2. The general rule for selection of extreme values was to use the confidence interval bounds reported in the cited literature. In some cases, such as the probability of liver transplantation, extreme values corresponded to the minimum and maximum values used in the literature on cost-effectiveness analysis for the treatment of HCV. The analysis only compared results between biopsy and the sequential ELF test/LSM. Results are presented in the form of tornado diagrams (Figures 2 and 3). Figure 2 Deterministic sensitivity analysis for hepatitis C virus. HCV: Hepatitis C virus; QALY: Quality-adjusted life year; ELF: Enhanced liver fibrosis test; LSM: Liver stiffness measurement; HCC: Hepatocellular carcinoma. Figure 3 Deterministic sensitivity analysis for alcoholic liver disease. ALD: Alcoholic liver disease; QALY: Quality-adjusted life year; ELF: Enhanced liver fibrosis test; LSM: Liver stiffness measurement. Probabilistic sensitivity analysis was performed by running 10000 Monte Carlo simulations per etiology group. New parameter values were randomly drawn from probability density functions in each iteration. Table 3 summarizes the results for HCV. Biopsy and ELF test alone had the highest rate of true F ≥ 2 cases detected (47.7%), and sequential ELF test/LSM produced the largest rate of true negatives (44.5%). In cirrhotic HCV patients, biopsy and ELF test yielded the highest rate of true positives detected (18.1%), and biopsy had the highest rate of true negatives (71.9%). Table 3 Diagnostic accuracy, health outcomes and costs in hepatitis C virus patients. 1Percentage of cases detected on first test. Initial prevalence: liver fibrosis = 53%; cirrhosis = 20%. TP: True positives; FN: False negatives; TN: True negatives; FP: False positives; QALY: Quality-adjusted life year; ICER: Incremental cost-effectiveness ratio (€ per QALY); ELF: Enhanced liver fibrosis test; LSM: Liver stiffness measurement. All testing options resulted in a substantial reduction in the number of events compared with the no-testing option. In particular, sequential ELF test/LSM and ELF test alone reduced the frequency of new cases of cirrhosis to 0.9% and 0.2%, respectively. Similarly, liver fibrosis-related death was 47.9%, 13.5%, 0.6%, and 0.2% under the no-testing, biopsy, sequential ELF test/LSM, and ELF test alone options, respectively. ELF test alone was the most effective strategy (16.75 QALYs) and it had the highest associated cost (€60443 per patient). The ICERs for ELF test/LSM and ELF test alone were €13438 and €11484 per QALY, respectively. Results for ALD patients are presented in Table 4. As in the HCV case, biopsy and ELF test alone produced the highest rate of true F ≥ 2 detected (47.7%), while ELF test/LSM had the highest rate of true negatives (45.2%). In cirrhotic ALD patients, biopsy and ELF test delivered the highest rate of true positives (18.1%), while ELF test/LSM generated the highest rate of true negatives (73.5%). Table 4 Diagnostic accuracy, health outcomes and costs in alcoholic liver disease patients. 1Percentage of cases detected on first test. Initial prevalence: liver fibrosis = 53%; cirrhosis = 20%. TP: True positives, FN: False negatives; TN: True negatives; FP: False positives; QALY: Quality-adjusted life year; ICER: Incremental cost-effectiveness ratio (€ per QALY); ELF: Enhanced liver fibrosis test; LSM: Liver stiffness measurement. ELF test/LSM or ELF test alone reduced the frequency of events significantly although frequency rates remained high. Liver fibrosis-related death was 68.8%, 66.5%, 54.8%, and 44.4% under the no-testing, biopsy, sequential ELF test/LSM, and ELF test alone options, respectively. In this type of patients, ELF testing alone produced the largest number of QALYs (11.94) but it was the most costly option (€14661 per patient). The ICERs of sequential ELF test/LSM and ELF test alone are €280 and €189 per QALY, respectively. Results of the deterministic analysis for key parameters in HCV individuals are summarized in Figure 2. The ICER was mostly sensitive to variations in the discount rate, cost of antivirals, and the cohort’s initial age. The lowest ICER (€5800 per QALY) was obtained when the discount rate was 0, whereas the highest ICER (€21400 per QALY) occurred when the assumed cost of antivirals was high (€72000 for a 12-wk treatment). The remaining parameters of the model had a minor impact. Deterministic sensitivity results for ALD are shown in Figure 3. 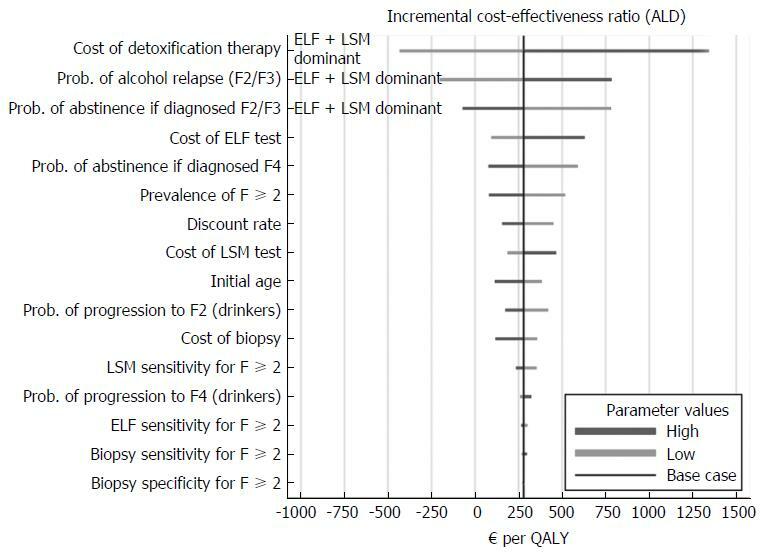 Sequential ELF test/LSM was superior to biopsy when the assumed cost of detoxification therapy was low (€173 per individual treated). ELF test/LSM was also superior to biopsy when individuals diagnosed as F2/F3 had a high probability of abstinence (43%) and a low probability of relapse (17%) within a year. In all other cases studied, the ICER of ELF test/LSM compared to biopsy was smaller than €1400 per QALY. 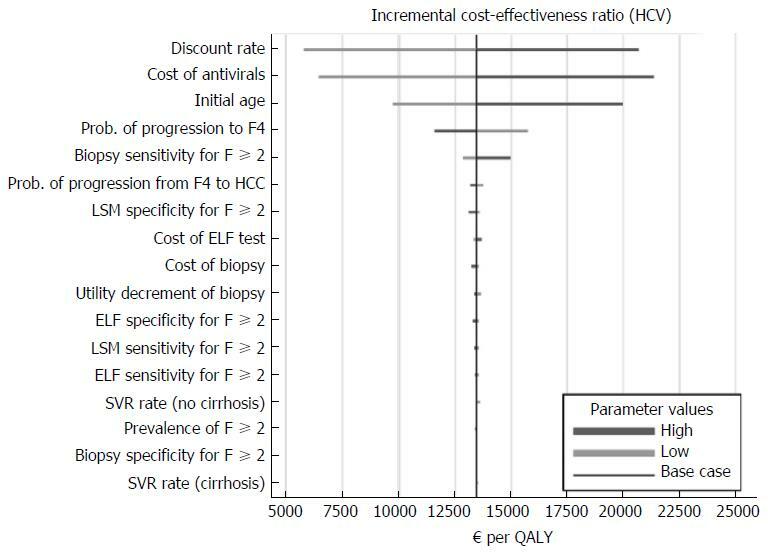 Figure 4 presents cost-effectiveness acceptability curves for HCV and ALD. 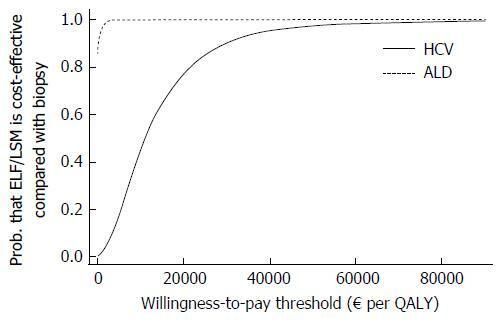 The figure shows the probability that sequential ELF test/LSM is cost-effective compared to biopsy at different levels of willingness-to-pay (WTP) for one QALY. At a WTP of €30000 per QALY the probability that ELF test/LSM is cost-effective is 90.1% and > 99.9% in HCV and ALD, respectively. For this last etiology group, ELF test/LSM is cost-effective with a probability larger than 85% at any WTP. Figure 4 Cost-effectiveness acceptability curves in hepatitis C virus and alcoholic liver disease. HCV: Hepatitis C virus; ALD: Alcoholic liver disease; QALY: Quality-adjusted life year; ELF: Enhanced liver fibrosis test; LSM: Liver stiffness measurement. To our knowledge, this is the first study that estimates the cost-effectiveness of the sequential use of ELF test/LSM for the assessment of liver fibrosis. Our findings show that ELF test/LSM is a cost-effective strategy for a WTP of €30000 per QALY, the cost-effectiveness threshold commonly used in Spain. At this threshold, the net health benefit of ELF test/LSM compared to biopsy is €17526 and €39450 per HCV and ALD patient, respectively. The probabilistic sensitivity analysis showed that the results were robust. Previous research for HCV patients in the UK showed that treatment with antiviral agents without liver testing was the most cost-effective strategy to reduce liver fibrosis occurrence and progression. However, that study was based on interferon-containing options. New, interferon-free options are costly and providing all HCV patients with the treatment can be a financially unsustainable strategy for some countries. In this situation, an ELF test/LSM strategy may help to balance sustainability with right care since it would be able to promptly identify non-invasively those HCV patients in early stages of liver fibrosis and to grant them access to treatment. In ALD patients, sequential ELF test/LSM and ELF test alone are both cost-effective strategies compared with biopsy. Moreover, for this group of patients ELF testing alone is only slightly more expensive than the ELF test/LSM strategy. Therefore, ELF testing alone is a highly cost-effective strategy for ALD patients. Finally, because ELF can be easily performed at primary health care centers it can provide a more equitable access to early diagnostic and treatment for HVC and ALD patients with incipient liver fibrosis. Moreover, the sequential use of ELF test/LSM may contribute to a better selection of patients in need of treatment, thus improving on care appropriateness and potentially reducing costs for both patients and hospitals. The study has several limitations. First, numerous parameters were sourced from small or single studies. This was especially apparent for information regarding ELF test accuracy and the efficacy of detoxification therapy and alcohol relapse rates, among others. Further research is needed to address this shortcoming. Additionally, most of the clinical data and prevalence rates used in the analysis came from studies carried out outside of Spain. Although discrepancies in clinical data across countries may affect country-specific effectiveness and, therefore, cost-effectiveness ratios, we do not expect important differences in patient characteristics and professional expertise in our country compared to others. Moreover, the sensitivity analysis showed that results were robust to wide variations in the underlying clinical parameters. Secondly, the estimates for sensitivity (90%) and specificity (90%) of liver biopsy were obtained from a study whose estimates are themselves based on clinician opinion. Nevertheless, the sensitivity analysis showed that variations in the accuracy of biopsy did not affect the main results. Finally, cost estimates were obtained from our hospital or from Spanish sources. Differences in economic data across countries may affect the final results. However, the wide variation in the unit costs that we have used in the sensitivity analysis systematically corroborated that the sequential ELF test/LSM strategy was cost-effective. In conclusion, testing for liver fibrosis annually with sequential ELF test/LSM or ELF test alone resulted in a substantial reduction in the number of events (cirrhosis, hepatocellular carcinoma, and fibrosis-related death) and a significant increase in QALYs for HCV and ALD patients, compared with a single liver biopsy. Out of the three options analyzed, ELF testing alone had the best health outcomes for both etiology groups (i.e., HCV and ALD), but it was also the most costly of the strategies. In light of these results, sequential ELF test/LSM can be considered as an option providing a balance between proper care and costs, especially in HCV patients. In ALD, the preferred strategy is ELF testing alone as its low incremental cost and large associated health gains make it a highly cost-effective option. We are grateful to Krzysztof Lach, Gemma Lorente and Laia Rodríguez from Hospital Clínic Barcelona for their valuable assistance. The tremendous advances made in biomedicine and biotechnology during the last decade have led to long-standing “gold standard” invasive diagnostic and therapeutic procedures being challenged by novel, rapid, and noninvasive methods. Noninvasive diagnosis of liver fibrosis (LF) is one of the fields that has evolved most rapidly in recent years. Diagnosis and follow-up of liver diseases has long relied on liver biopsy, and only recently has its value as a method to assess the severity of LF or to follow-up disease progression been questioned. Though biopsy is used to stage most cases of liver disease, it is well known that this procedure has several limitations. The aim of the current study is to assess both the accuracy of the sequential use of enhanced liver fibrosis (ELF) test/liver stiffness measurement (LSM) in the evaluation of the severity of liver disease and its cost-effectiveness compared with the use of biopsy in patients with hepatitis C virus (HCV) or alcoholic liver disease (ALD). The authors found that the use of the ELF test with or without a confirmation LSM are cost-effective options compared to a single liver biopsy for testing liver fibrosis in HCV and ALD patients in Spain. This is a very clearly written paper, and the authors make a good case for why the topic is an important one, particularly in a medical landscape that is changing rapidly as new technologies become available.